Muslims pay 15 times more “religious tax” than the rest of the world gives in humanitarian aid. Ramadan, the ninth month of the Islamic calendar, has just started. A time of fasting for devout Muslims, this is also the time of year when most Muslims pay their annual zakat. Zakat is a form of compulsory almsgiving, a kind of “religious tax.” The amount due is 2.5 per cent of a Muslim’s wealth at the start of Ramadan, subject to a minimum threshold. The Koran contains clear rules about who is eligible to receive zakat: in general, these are people who are poor or otherwise needy. The meaning of the word zakat is associated with the concept of purification. Sharing one’s wealth with the poor brings about a kind of religious purification. Global estimates suggest that Muslims give between NOK 1,200 and 6,000 billion in zakat each year. For comparison, the approximate value of Norway’s “oil fund” is NOK 4,000 billion. According to figures from the UN, even the lower estimate for the annual amount of zakat equals 15 times the annual total for global humanitarian aid. Muslims’ personal religious almsgiving is not included in official aid statistics. Zakat is a religious obligation for Muslims, but many also make voluntary charitable contributions known as sadaqah. While the Koran encourages Muslims to give sadaqah secretly, it is up to individuals to decide how openly to give their zakat. If the motive for giving money is to display one’s wealth, this nullifies the religious reward. The discretion surrounding these donations means that it is nearly impossible to obtain a true picture of the scope of charitable giving among Muslims. Much of the money, probably most of it, is donated in private. Many Muslims allocate their zakat themselves, either among needy people in their neighbourhoods or among relatives who are experiencing hardship. Others give through their mosques, to local charities, or to major international Islamic aid organisations. 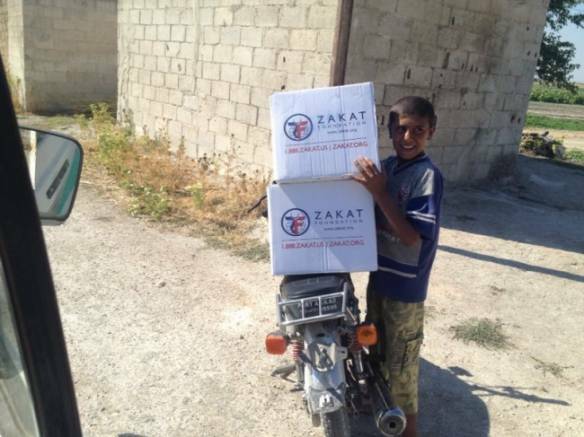 Many of the larger organisations run TV and internet campaigns to encourage people to give zakat through them. Even so, estimates put the amount of privately distributed alms far in excess of the amounts given through official channels. Obligatory and voluntary almsgiving by Muslims is widely seen as a tradition that brings about a reallocation of resources within society. Nevertheless, Islamic aid organisations are often criticised for failing adequately to address barriers to reducing poverty. They are accused of focusing too much on charity and too little on development: in other words, and to paraphrase a well-worn proverb, they “give people fish” rather than teaching them to fish for themselves and “feeding them for a lifetime.” In our experience, the picture is much more complex. In Islam, the concept of charity covers everything from soup kitchens, children’s homes, schools and hospitals, to training in employment skills for women and (interest-free) micro-credit programmes. Today the leading Islamic aid organisations are engaged in long-term strategies to reduce poverty and are not so very different from Western aid organisations. Muslim philanthropists are working actively to find ways to make Islamic charitable giving more effective, while at the same time preserving the unique aspects of the tradition. New types of organisations are emerging, internationally as well as nationally, as evidenced by the growth of major NGOs. Islamic Relief and Muslim Aid are two examples from the UK. These organisations work across national borders and receive funding from the British aid budget. Religious and non-religious organisations co-exist in the humanitarian sector, although cooperation between Islamic and Western aid organisations still occurs only exceptionally. Christian organisations, such as Norwegian Church Aid (Kirkens Nødhjelp) and Caritas receive funding from official aid budgets, but this is still less common for Islamic aid organisations. The conflicts in Afghanistan, the Balkans, and Iraq have contributed to tarnishing the reputation of Islamic aid organisations, among other reasons due to suspected links to militant groups and terrorists. Following the 9/11 attacks, Islamic aid organisations were accused of involvement in financing militant groups and terrorists. Organisations were targeted for financial investigation and had their bank accounts frozen. Hopefully this helped put a stop to organisations with malign objectives. Many bona fide Islamic aid organisations, however, have found that their efforts to help people living in poverty are being viewed with suspicion. In Muslim societies, these are the organisations that are best placed to provide aid, and today many apply the same professional principles to their work as other aid providers. While critical questions may be sometimes be appropriate, they should not be based on old prejudices. Norwegian Muslims also give zakat. Their alms are given privately, through mosques, or through organisations that may or may not have explicit religious links. For many Muslims living in Norway, the obvious course of action is to help people living in the countries from which they – or their parents – emigrated. Accordingly Norwegian Muslims’ almsgiving merges into the global transfer of funds from migrants to their countries of origin. Since many people prefer to be discreet about their almsgiving, the recipients of the money will not necessarily be aware that they are receiving alms. These financial contributions help deprived relatives in their everyday lives and allow them to put better food on the table when breaking their fasts each day during Ramadan. The money may also be put towards school fees and medical expenses. It is not unusual for religious alms to be used to fund the building of schools and hospitals in Pakistan, Turkey or Sudan. Money is collected at mosques, women’s groups and social gatherings, but also through appeals that run on TV and the internet. Many Norwegian Muslims also give money in the wake of natural disasters, for example the earthquake in Pakistan in 2005, or in connection with the war in Syria. Like many other people living in Norway, they wish to help people in need. While it is difficult to estimate how much money Muslims in Norway donate to charitable causes each year, we do know that many do donate in various different ways, both as obligatory and voluntary almsgiving. They give for a common purpose: to help the poor and needy. This “religious tax” is paid in addition to ordinary Norwegian state taxes, and the money is earmarked for helping those who need it most. This text was published as an Op Ed in Norwegian in the daily Newspaper Klassekampen 11 July 2013.